I had a little bit of time today to make an extra special dinner. I have not cooked anything interesting for dinner in a while. A lot of pretty amazing people have been making my family some dinners, or we have gotten take out, or I have thrown together something random that was not really blog worthy. It has been a crazy few weeks. When people find out or know you have a sick kid, it can be a bit awkward. They feel helpless and don’t know what to do. The problem solvers and leaders are the ones who want to take over and figure out a way to help. They rally the troops. They bring you food, money, toys, offer to carpool, take your dog for a walk (good luck with that- I am the only one who can get him on a leash), and pretty much give up their left kidney for you. I appreciate it all. I am thankful. All these offers actually are amazing and do provide relief and a weight off my shoulders. As much as I love to cook, I do have a cooking blog after all, what I really want to do is sit on my couch and snuggle my girls. I want to play with them as much as possible and just relax together as a family. But lately I have been itching to get back in the kitchen for a bit. I thought…I meandered in the kitchen; I opened the pantry;I looked in the fridge; I looked in the freezer. I had an idea. I pulled out some ground beef from the freezer, found some canned tomatoes in the pantry, borrowed an onion from my awesome neighbor, poured a glass of wine, and I started to get my groove back in the kitchen. 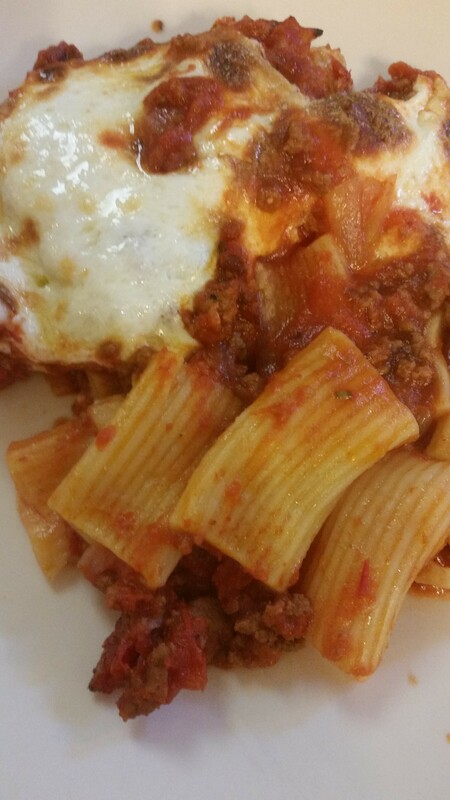 I gave Lizzie the choice of lasagna or baked ziti based in the noodle selection from my pantry. Well, she picked this. And I gladly obliged. I may be a bit scarce on the blog in the next couple of months. I cannot stop cooking. I won’t. It is my hobby; it is therapeutic. I may post a Sunday roast, an epic Thanksgiving dinner, a glamorous grilled cheese sammie, or a regular Wednesday chicken dish. 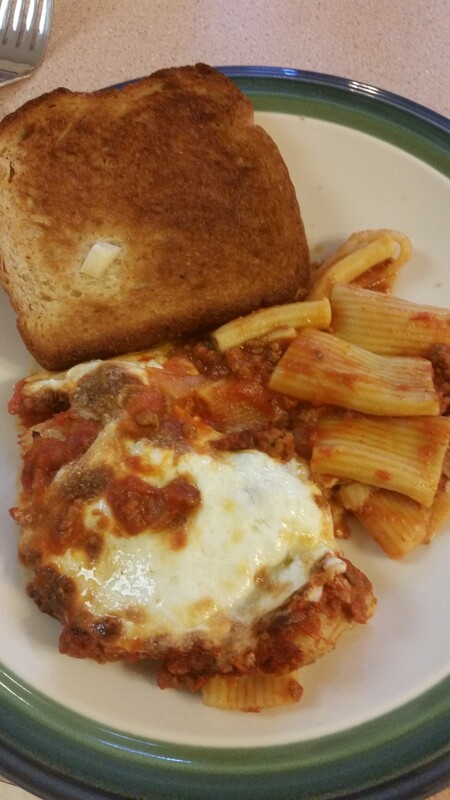 Whatever I post, it tastes yummy and is made by my love of cooking and making my family and friends happy. Brown your beef. If there is any grease, drain it. Add your onions. Cook down for 5 minutes. 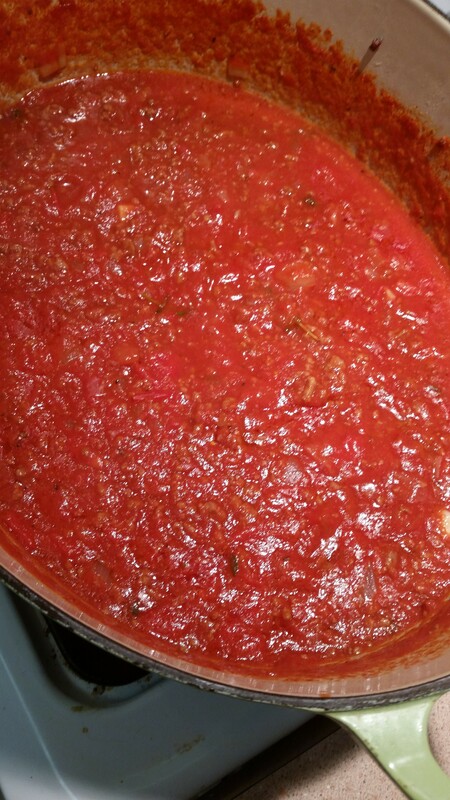 Add in your garlic and tomato paste. Cook down for 3-5 minutes. You can actually smell the tomatoes when they are mixed well with the garlic. The aroma is amazing. The beef and onions should be really camariling now. Add just a splash of red wine down in the pot to loosen up all those brown bits. Then add in all your canned tomatoes. Mix well. Add in your sugar, worcestershire sauce, butter, and thyme. Mix and simmer for at least 30 minutes. The longer the better. Make your pasta. Undercook by 3 minutes according to the package. It should still have a bit of a bite to it. Spray your dish with Pam. Add some sauce on the bottom. Put in your noodles. Cover with sauce. Top with Mozzarella cheese. I made some quick garlic toast by melting butter with some 3 cloves sliced garlic. I dipped the bread in the garlic butter then put them in the oven on broil. Just check the oven to make sure they don’t burn. Delish!